Green 6 in front of a Redwood. This week was full of sleepy eyes and fraying nerves. As our hearts became heavier with the yearning for home or some semblance of it, it took us depending on our team, and really examining our personal coping skills for us to survive. Almost 30 people have decided to leave the program in the two and a half weeks we have been here. It’s hard to say their reasons – other opportunities, inability to follow policy, a want for comfort in the midst of change – whatever it was, it has cut their time short in Sacramento. Maybe their journey was never supposed to lead them here. Whatever the case, people leaving often brings up the question of what we would be doing if we hadn’t joined NCCC. It has created a ‘what if’ culture on our campus. This week, my team learned that the ‘what ifs’ are the things that can hurt us the most. 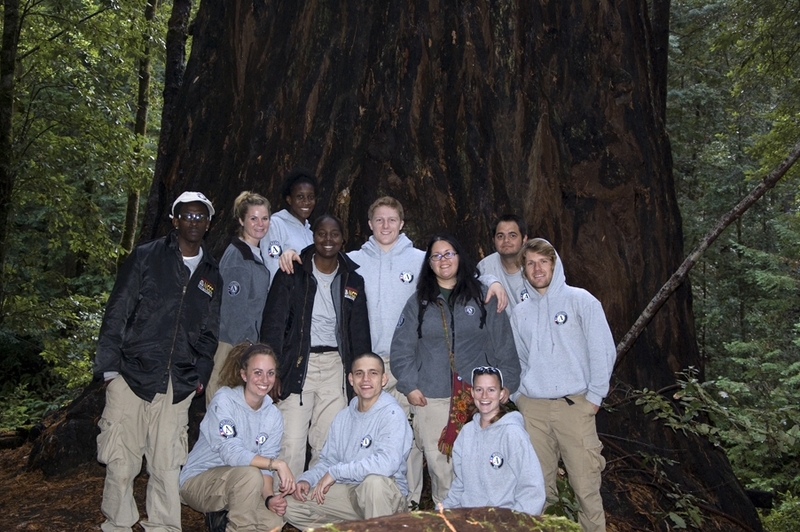 Green 6 traveled to Camp Mendocino for three days this week, a 4 hour drive Northwest of Sacramento. It is affiliated with the Boys and Girls Club, and is considered to be “off the grid”. They are a self-sufficient operation, using generators for electricity and filtering their own water onsite. 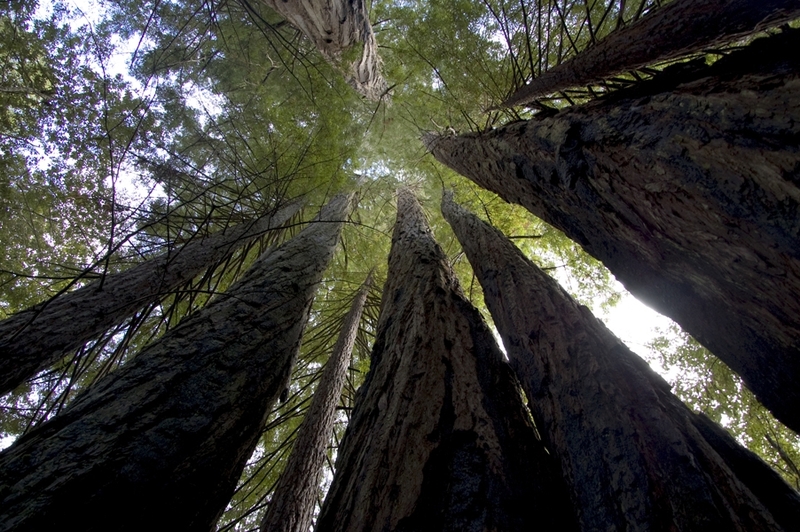 The camp is lost in a forest of giants. 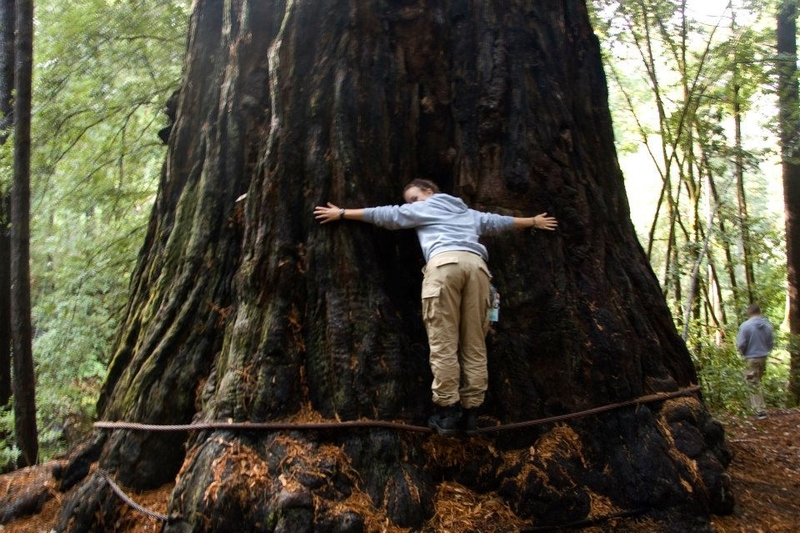 Mountains and old growth Redwoods surrounded us, dwarfing our sense of importance. The trip there was meant to act as a mini spike (The term “spike” comes from the 1930s CCC, a model for our own program. It basically means our 6-8 week assignment). We practiced our driving skills, found out what housing for a project might look like, and got to help out with some trail maintenance. 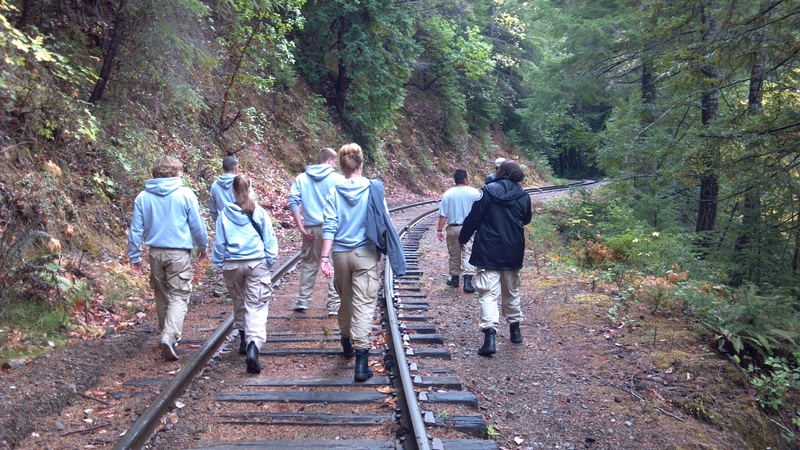 Of course, there was time to do some camp-like things as well: hiking, campfire, and challenge course. 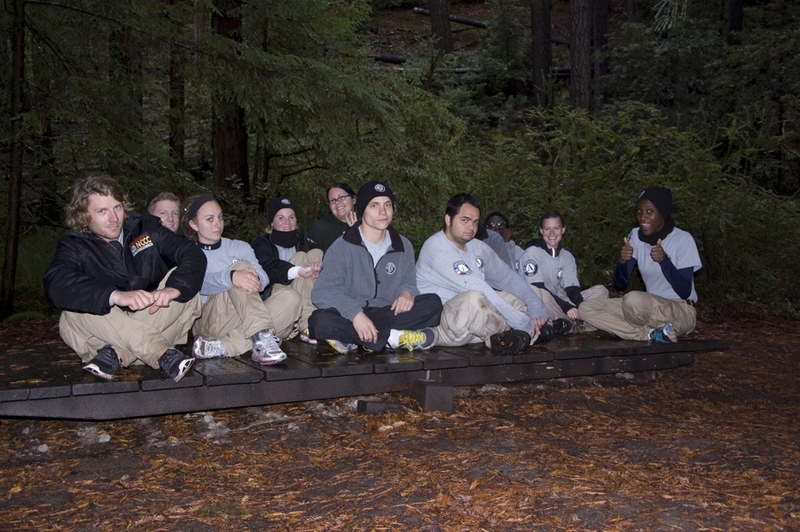 Challenge courses are meant to shed light on both strengths and weaknesses as a team in terms of communication, leadership, and flexibility, among other things. 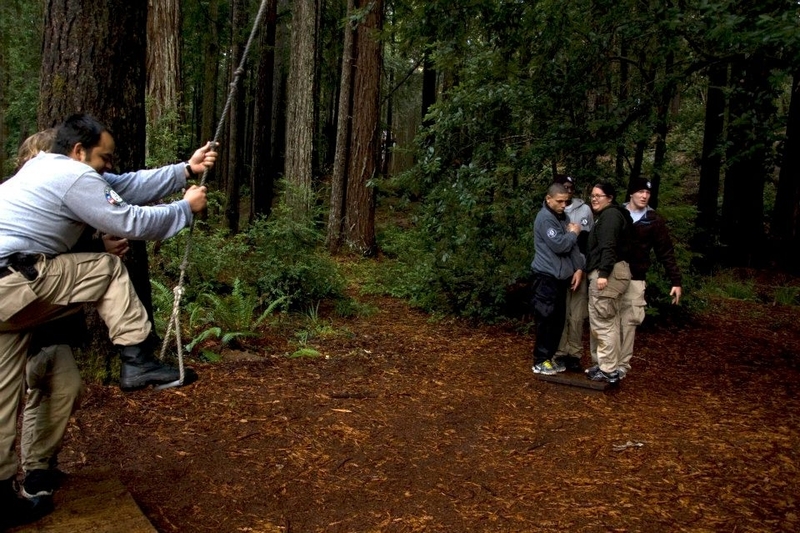 A good challenge course facilitator lets you get frustrated or fail, which is exactly what our facilitator did. By the end of the day, we realized that we were so afraid of being wrong, that more than half the time, we didn’t event try. It wasn’t until the exercise was over that we understood our wasted potential. The reason we were so frustrated with each other was not because we were doing it wrong, but rather because we saw fear becoming a barrier. The facilitator left us with parting words that I hope our team will bring with us as we work and live together: You’re going to be afraid to fail, but you’re going to fail anyway. You will not always get it right, but accept that it will happen and keep moving forward. Never be afraid to try. Never be afraid of the what if. There is a marked difference between questioning and what ifs. Questions push a person to seek, and test their motivation to find the answer. Genuine questions are the ones that teach us the most. What ifs make us stagnant people, unable to move forward due to fear or anxiety. What ifs immobilize our sense of adventure and intuition. To a certain extent, each person on my team and in the NCCC program is a wanderer, a what if asker. It is not being content stagnant in our knowledge that leads us into the wild and forgotten places. Sometimes we are found in these places only to be lost in ourselves, in the what ifs. Through the fields and rose bushes; under the clouded, speckled sky, and into the deep forest we search for newness and answers. What if I changed my setting? What if I didn’t take this opportunity? What can we learn from the hum of the van tires below us? Each passing mile has the potential to scar us and heal us at the same time; what if either happened? What if…? It isn’t always in adventure we are searching; it is in the new serenity and potential of places. The land has a vastness to it so as the sky meets to kiss the horizon. Maybe these mountains in the distance will get us higher to the heavens where we will find the answers. There is an unquenchable spirit in our hearts, a longing for answers that will only be found once we have turned the world over. My what if statements are the ones that rule my mind some days. It’s inevitable. I’ll spend too much time worrying about the thoughts or reactions of others. I’ll spend too much time worrying what a typical 23 year-old would or should be doing otherwise. I’ll spend too much time worrying what or if I’ll ever commit to a job, a person, or a place. The what ifs are creeping into our team as we explore, not only the state around us, but each other as friends, companions, and confidants, and I can only hope we grow out of this phase soon. I look forward to learning our first “spike” assignment tomorrow, which will, at the very least, help one of our what ifs pass – where we’ll be living and working for 6-8 weeks starting November 7. I can’t seem to get a good grasp of what I learned this week because I feel as though neither my team nor I have quite come out the other side of it yet. We are still frozen in our what if for the moment. Sometimes life doesn’t pack our lessons into neat, scheduled packages. We are still attempting to hold the space for each other, giving one another time to figure out what we need to know about ourselves and the team. Given time, I am confident we will abolish the what if.